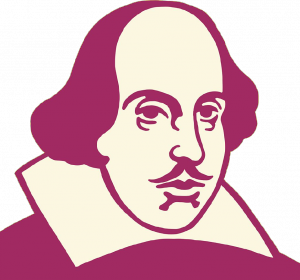 Our Facebook and Twitter messages recently have featured Shakespeare and learning sonnets. 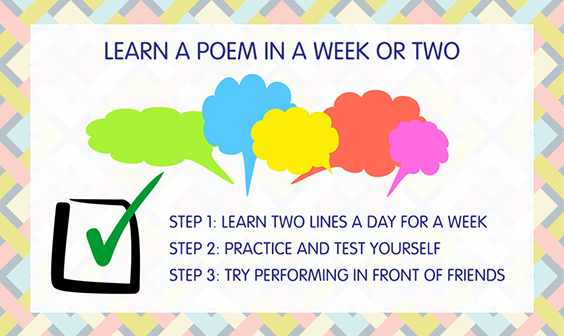 We thought it would be a fun challenge to see if you could learn a sonnet in a week to join in with our Shakespeare Sonnet competition, which is all about making it quick and easy to run a poetry recitation competition in your school. You only need one competitor to enter, and anyone in your school – students from Year 7-13, and teaching and support staff, too! – can take part (we hope you’ll find than one). We’ve created a really easy little step by step ‘recipe for a competition’ cheatsheet for you to download, which tells you everything you need to know about holding this competition. The Shakespeare Sonnet competition deadline is 31st March 2017, and we have prizes for winners so be sure to tell us who they are! Did you know our Shakespeare Sonnet Showcase has been designed to help you find your favourite sonnet? Each sonnet contains audio clips to listen to, and there are activities designed to help you explore your sonnet in different ways. Our filters also help you discover sonnets by theme and keywords – why not try a word based on your mood or your favourite season to see what pops up? Poetry By Heart 2017 at The British Library! 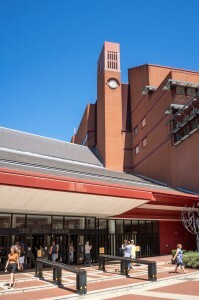 We’re delighted to announce that we’re holding this year’s Poetry By Heart Winners’ Weekend at the prestigious British Library in London. The Winners’ Weekend is where all the county winners from this year’s Poetry By Heart competition will be competing to win the coveted Poetry By Heart National Winner’s Trophy. The very best reciters of the Shakespeare Sonnets will be invited to perform their poems live on stage at this special occasion. There will be prizes! The Winner’s Weekend is taking place on 22nd and 23rd April 2017, and we’ll be sharing more details throughout the next few weeks so be sure to sign up to our newsletter and watch this space. Here’s a little about some of the judges who have confirmed will be there so far! Free Registration Pack On Its Way To You! If you’ve already registered, you will already have your competition handbook, but if you’ve misplaced it, just email us via info@poetrybyheart.org.uk and we will send it to you within 24hrs of registering. The handbook has everything you need to get started immediately. 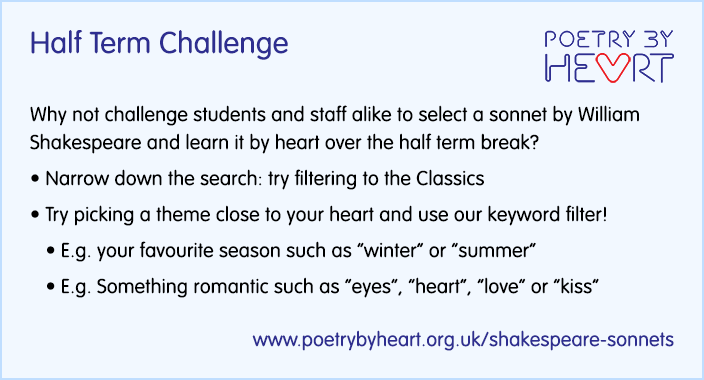 There is still time to hold a small Poetry By Heart competition (all you need is three students), or the Shakespeare Sonnet in a Month challenge. Our Poetry By Heart Learning Zone is coming soon. 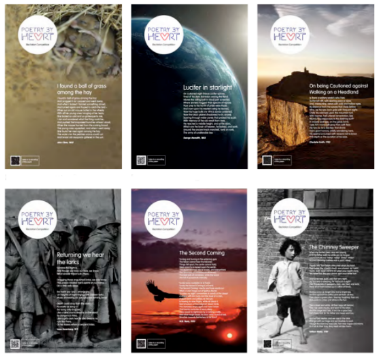 Full of tips and tricks on how to bring more poetry into the classroom, as well as some of our guides on how to make the most of the website. We’ll announce it’s live via our newsletter and the blog, so be sure to watch this space! We have plenty of experience in helping schools hold their competition – and we can get you set up as quickly as 3, 2, 1 – three students, two poems each, one winner. Whether you decide to the main competition or the Shakespeare Sonnet competition (remember: you only need one entrant for that! ), the first step is getting in touch – so drop us an email and let us know what you’d like us to help you with today. Help your students learn poems by heart – and have fun! Join the FREE competition for schools and colleges in England. Our Poetry By Heart poetry recitation competition is open for 2017! It’s our fifth year running the successful competition designed to take poetry off the page and bring it to life through teachers and students and on the stage. It’s very easy to participate! All you need is 3 students, 2 poems and 1 Spring term! 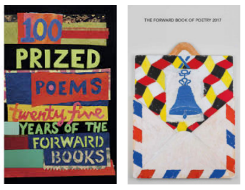 our competition handbook to help you get students learning poems by heart. If you’re not at a school in England you can still learn more by signing up for our newsletter where we’ll keep you informed of all our latest developments and the newest poems made available on our site. These web resources are free to use for anyone, anywhere in the world – fill your boots! Or get in touch with us via info@poetrybyheart.org.uk with your questions. We’re absolutely delighted to announce a brand new showcase dedicated to celebrating Shakespeare and his sonnets written over 400 years ago. 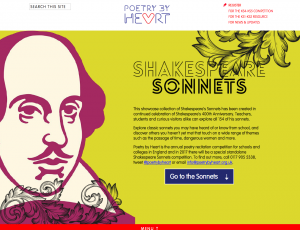 The Shakespeare Sonnets showcase has been designed to be really accessible to students and teachers alike; we’ve made all 154 sonnets available for you in one easy to view page. Jump into a random sonnet or use the filters to sort through numerically, or find a sonnet that fits a theme you’re currently discussing. The keyword search facility is excellent for finding that one sonnet you’re looking for, or just sating your curiosity. We’ve also handpicked an assortment of sonnets we’ve called our Chosen 60 that we think are particularly interesting, with activities to bring the sonnets to life just a click away. Take your ears on a Shakespearean journey and listen to the sonnets performed by various notable performers and – if you’re really inspired – why not pick a sonnet to recite in our up-coming Shakespeare Sonnet competition – watch this space for more information soon! Have you had a chance to view our other showcases? Our First World War Poetry showcase is different to typical collections, introducing a wide range of voices on the event, and our Poetry For Children has been created with bright colourful pictures to capture imaginations and fun activities to try. Our newsletter is free and sent straight to your inbox. Sign up here and we’ll keep you informed of all of the latest poems on the site, up-coming events news and more. If you still have questions, get in touch with us by email via info@poetrybyheart.org.uk or call 0117 905 5338.